Sometimes simplicity and minimalism provide wonderful experiences. The Vibram Five Fingers shoes are excellent for outdoor activities and for working out at the gym. The natural feeling that comes with being outdoors with these shoes enables the wearer to feel one with nature. Walking while wearing these shoes is a sensory experience that allows you to notice and feel the Earth. Time Magazine named Vibram Five Fingers shoes among the best inventions of 2007 along with other products like the Apple iPhone. Besides Vibram, some other companies also market shoes that provide a barefoot-like experience. Nike sells the Nike Free line of shoes, though the Vibram Five Fingers experience is much closer to being barefoot. A company called Terra Plana makes their Vivo Barefoot shoes. These shoes do provide a good level of protection and safety compared to walking truly barefoot. Personally, I would not be barefoot while hiking in the mountains or walking the streets of New York City, so these shoes provide me with an excellent balance of safety, comfort, good exercise and the thrill of a natural feeling. According to Vibram, Nike and Terra Plana‘s separate marketing materials and others’ independent research, the barefoot-like experience provided by such shoes is good for the health of your feet and legs on the long term, since they allow your muscles and bones to get proper exercise that other shoes inhibit. Since these shoes do not offer the cushioning via a thick sole of protection regular shoes do, you do need to be cautious while wearing them, especially while you are getting used to them. If you go hiking with these, consider taking along a pair of regular shoes as backup. I plan to go hiking wearing these and they will likely become my hiking shoes of choice, a position currently held by my Nike Free 3.0 shoes. I’ve hiked in the Georgia mountains wearing Nike Free 5.0 shoes and on a part of the Appalachian trail in New Jersey wearing the even thinner soled Nike Free 3.0 shoes. Those hikes included treading on sharp rocks and river crossings. Walking through water over the riverbed wearing barefoot-like shoes is such a soothing experience. I kept a pair of regular hiking shoes in my backpack as backup, but was able to complete the hikes without needing to resort to the backup shoes. Hiking wearing the Nike Free shoes that felt close to being barefoot was a wonderful zen like experience. One drawback: Since the Vibram Five Fingers shoes look too unconventional, they are not suitable for wearing to many social events. A suggestion for Vibram: To some models, add a thin cloth or rubber film/layer on top that makes them look more like regular shoes from above while preserving the independent fingers movement on the bottom sole. Such a thin layer of film would be for looks only. Beneath it, the toes would still be independent. With that, people would be able to wear these shoes in many social situations. I love Vibram Five Fingers shoes and highly recommend them. I wish that Vibram decides to make other versions of these shoes that will provide all the benefits these shoes do, but also look more like conventional shoes from top. If Vibram does so, they would become the shoes of my choice for all casual wear. It would be even more awesome if Vibram one day designs Five Fingers shoes that look like formal dress shoes from aboce. If they do that, various models of Five Fingers shoes would become my favorite shoes for almost all walks of life. My rating of these shoes: 4/5 stars. I am a big fan of mine. I know they are ugly, but people got into Crocs recently. You can't say those are fashionable. This past weekend, my fiancée Julie and I went to Milwaukee to attend our friends' wedding. I wore my Vibrams for a major part of the weekend. (Not while attending the wedding ceremony of course :-). I wore them walking around the lake, at an art fair, while exploring the city and on the flight back to NYC. A lot of people, both women and men, complimented me on the shoes and asked where they could buy them. I referred them to CitySports (where I bought them) and to the Vibram Web site. In my limited experience wearing them socially, other people seemed to like them. As a bonus, while other passengers on the flight had to remove their shoes to pass through security, the TSA folks let me continue wearing my Vibrams which in shape and bulk are closer to thick socks than shoes. I noticed that since I was enjoying wearing these shoes and I wasn't embarrassed or self-conscious of them, other people didn't seem to dislike them at all. As long as the wearer likes them and is confident, they are fine for some social situations. I enjoyed wearing them a lot. Walking around with them is like getting a massage and a workout at the same time. I work for a stockist of the FiveFingers and love them! I wear them for running and i take them to my yoga class and they really strengthened the muscles in my feet and made my feet more flexible! When running the feeling is really invigorating! they encourage my feet to land on the forefoot first, which has in turn reduced all the pain i used to get in my heels when running in standard running shoes. I'm a complete barefoot advocate (but like you was a little worried about walking the street with no protection on my feet which makes FiveFingers perfect! Wired's review by my colleague Dylan Tweney says "Vibram FiveFingers … are wickedly fun to wear. … Traction is incredibly good, due to the grippy material, the separation of the toes, and the addition of siping, or tiny zigzag cuts etched into the soles that expand into little treads as the sole flexes. The VFFs are also surprisingly comfortable. Each toe is snuggled inside its own little pocket, which is not only cozy, it also gives your feet a surprising amount of feedback about the ground you're standing on. Your toes, freed from their typical leather prisons, act like a tiny topography sensor array." 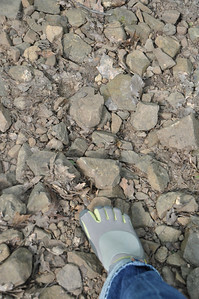 I found the Vibram Five Fingers to be surprisingly comfortable for the hike as well as a lot of fun! creating air circulation between the frame and the wearer’s back.